(Victorville, CA)– He is known far and away as the King of the Monsters. It is a title he has held onto since he crashed on the scene back in 1953. A heroic monster who took on all competition, defending humanity from threat after threat. 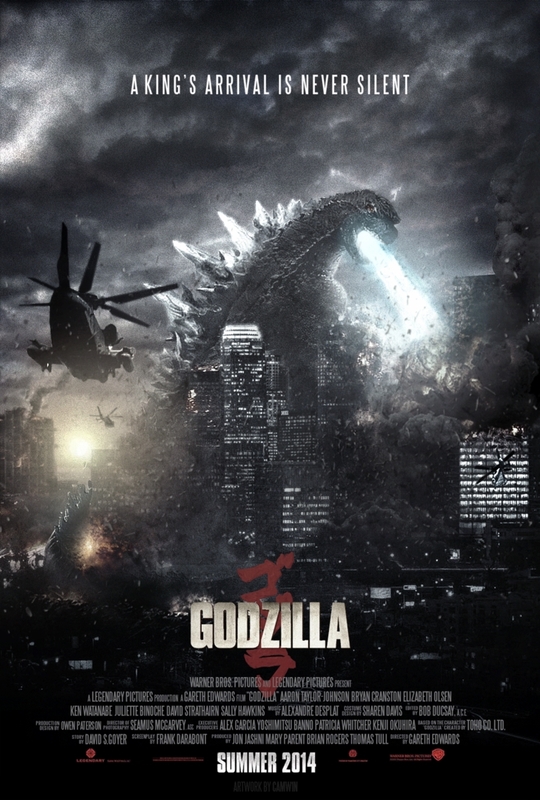 But now, time might be his toughest enemy yet: can the legendary Godzilla relaunch into the world of 2014? Not seen since the 1998 “relaunch” that seemed more like a flop than a hit, the gentle giant is back with a much grittier, darker film. Directed by Gareth Edwards, this newest installment has far more bright spots than falters. With this film, we get a reintroduction to Godzilla, and just how terrifying a monster of his magnitude would be to humanity these days. When Joe Brody (Bryan Cranston) and his son Ford (Aaron Taylor-Johnson) come across the secret of a quarantined power plant, the world is turned completely upside down. Of course, with a movie called Godzilla, we want to see one thing and one thing only: a monster free for all! With this film, we absolutely get it, as the King of the Monsters once again shows why it is good to be the king. Godzilla throws down with monsters called MUTO, which are not classic monsters that the green giant has fought before, but are terrifying nonetheless with an eeriness of their own. The feelings of watching the behemoths fight harkens back to the movies of old, which is exactly what this film needed to do. By the end of the film, I was already thinking about what is to come in the sequel. Yet, this film isn’t perfect, and the main reason, for me anyways, would be the human characters. Now, I think Cranston and Taylor-Johnson are great actors, but I felt too much time was devoted to human scenes rather than more monster beat downs. I know, it’s called character development, but I would much rather see a full movie full of monster mayhem than military characters discussing strategies. All in all, this is the film that needed to happen to propel Godzilla back into the spotlight. If you are unsure about seeing this, go ahead and take the dive. Just remember, if you are left craving more monster-based destruction, you are not alone. Previous The Batmobile and Batman Revealed: What Do You Think? Next Movie Review: Amazing Spider-Man 2- Why Hate Sequels? Nice review Nolan. Had a fun time with this. Even if the characters weren’t all that interesting to begin with, I didn’t get wrapped up in it too much, because I knew Godzilla was looming somewhere in the background.